Stratford airport lies just to the north of the Festival City and is where CG-EXU roosts these days. The airport manager, Andy is always willing to be of assistance to the local pilots and together with the airport mascot, Sadie the dog, the prevailing atmosphere is of laid-back calm. 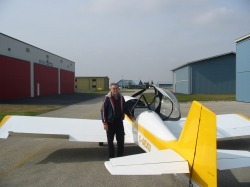 Tom Elms is the local AME who can almost always be found on the field and is a great asset for pilots looking for a full service base for their aircraft. It's not uncommon during the summer months to see some very nice business jets stopover as some of the wealthier pilots out of the US bring their families to town to see the famous Shakespeare festival, and pilots always can tell when fall has arrived when the MNR descends on the field with their Twin Otters for the annual fox rabies innoculation program..Stratford has two runways, the largest of which can easily handle most corporate jets (and of course my RV-4). The airport is uncontrolled and lies well enough away from other busier fields as to allow easy access in and out as pilots desire. Watch out for the local guy though, who likes to fly his own pattern while landing on the grass portion of the field. 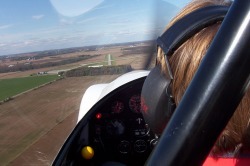 Photo at left shows hangar and main building with my RV4 and father-in-law. Heading out for a hop after some rain. The airport lies just to the top left of the photo (unseen). Shot of approach to the north runway at Stratford-the threshold is offset to the intersection of the main runway because of the stand of trees at the end. 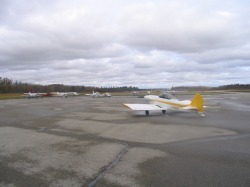 The wind usually is favourable to the longer, main runway. I was fortunate enough to score some hangar space in a private hangar in Stratford when I first moved up here and now share the room with some other interesting aircraft shown here as well as my landlord's other hobbies-old Jaguars. It's a good thing Dave keeps this Jaguar hangared because if it stayed outside any longer, I think it would crumble. I don't know the owner of this American-registered Aztec but it's shared hangar space with me for the past eight years.